There are moments in life that allow me to see the emotions on the faces of people, some sad, some happy occasions. One of these moments occurred in my own living room watching the faces of the guests attending the show Maggie Brown played there on a grey, late June Sunday afternoon. The sun shone within our house and not outside. 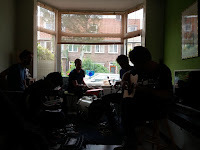 My girlfriend and I were lucky to have a fantastic band from Amsterdam and present it to our friends and guests. 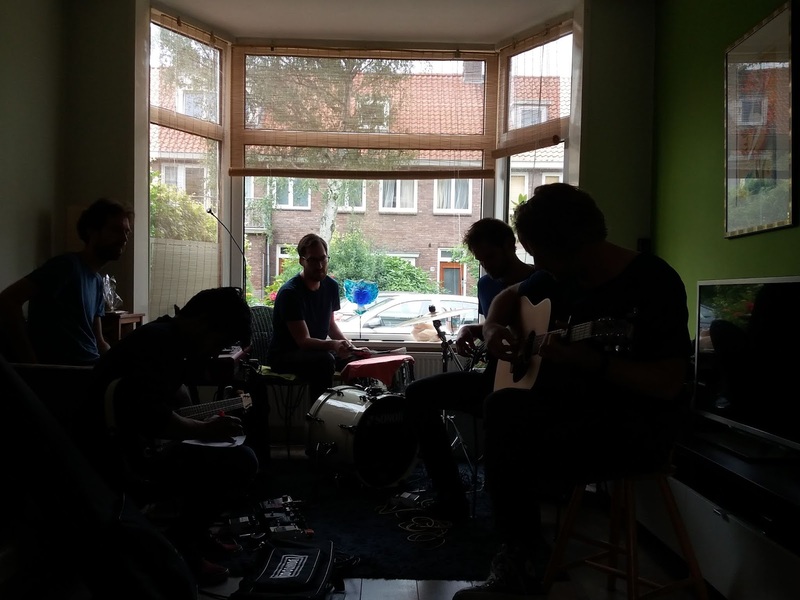 Considering this was the band's first living room show and lead guitarist Frank's first show with the band ever, I can only muse about what it can grow into. If anything the music of Maggie Brown lends itself for this setting and looking at the faces of the people listening it was clear no one went home untouched. Maggie Brown and I go back four years now, with the band's first eponymous album, followed by the Mountaineer solo album of singer/guitarist Marcel Hulst and last year 'Another Place', my favourite album of 2017 by the way. In those four years the band received a special place in my personal musical pantheon. Can I explain to you why that is? Basically no, there do not seem to be the right kind of words to describe how the music resonates within me, how it touches me and moves me. Simply that when I heard 'Hail To The Rain' for the first time, I knew instantly that I was listening to one of the most beautiful songs ever made. A song so beautiful that it nearly shocked me. Everything in it seems to be right. From the elementary guitar riff starting it to the exquisite mood changes within it. When the final part comes by I'm floored. Luckily for Maggie Brown it was not just me. I saw people smile of joy, a tear here and there and intense faces following every move of the music, full of admiration. I saw the power of beautiful music at work. Most who attended will have gone home and told about Maggie Brown, letting family and friends listen to its songs and spread the word. Should you be looking for a band to play in your own living room, you know where to go. I understand that the band is keen to do this more often, so grab your chance while you still can. Four shows into our living room concerts I can only state that it is not possible to enjoy live music more intimately. To hear everything, see everything, the at ease interaction between the musicians and the audience, the instant feedback musicians receive from the audience, is unique. It proves to be rewarding all around. There's certainly more to come.